Gavin Newsom wasn’t a frequent visitor to San Francisco’s west side during his (almost) two terms as mayor. But the California lieutenant governor was drawn to the Richmond on Saturday. Newsom was the main attraction this weekend at campaign rallies for David Lee, the insurance salesman and university lecturer who seeks to unseat Eric Mar as District 1 supervisor. Lee’s help from Newsom — the current mayor, Ed Lee (no relation) has not endorsed or campaigned in the Richmond — is notable as the lieutenant governor’s first foray back into local politics since moving onto Sacramento. 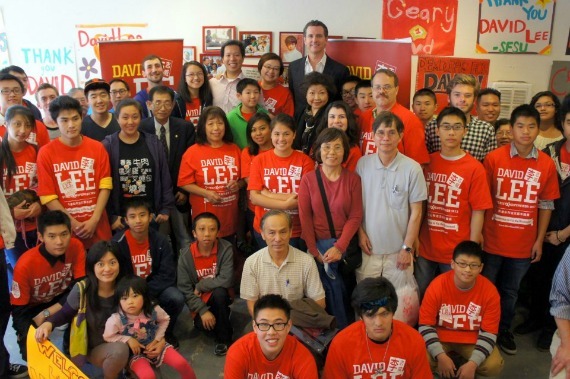 Lee has also drawn a record-breaking amount of soft money in his quest to unseat Mar, who has proven unpopular with police, property developers, and other moneyed interests. As of Friday — with spending over the weekend and up til polls close Tuesday still unaccounted for — there was $714,745 in third-party spending in District 1, according to records. This is the most third-party spending in any San Francisco district election. Of this, $550,806 was spent on supporting Lee or opposing Mar, and $163,939 was spent on supporting Mar or opposing Lee, according to records. This eclipses the previous record by a wide margin. The previous record, $540,489 in independent spending, was set when three candidates, including Mar, vied for District 1 in 2008. The next-highest amount is $524,525, set in District 8 in 2010, which was also a three-candidate race. The candidates may yet set records for “official” spending as well. As of Nov. 1, Lee reported $303,297 in spending, and Mar had raised $271,754. Independent expenditure committees, or IEs, are not subject to the same contribution limits as candidates’ campaign committees. By law, they are prohibited from participating with “official” election activities. “There has never been anything like this in the history of district elections,” Mar campaign spokeswoman Nicole Derse told the Appeal. Representatives for Lee, including campaign manager Jim Ross, did not return messages seeking comment. It’s simple to break down who’s spending for who. Lee’s backers include a who’s who of the city’s power elite, while Mar counts on financial support from unions. The spending for Lee comes from three major sources: the Coalition for Sensible Government, the Coalition for Jobs and Sustainable Growth, and the Coalition for a Safer California. The first two are familiar players in San Francisco politics. The San Francisco Association of Realtors funds the first coalition, which has spent $225,000 as of Friday. Real estate developer Thomas Coates ($50,000), the Golden Gate Restuarant Association ($40,000), and the Building Owners and Managers Association ($35,000) bankrolled the Coalition for Jobs. The last, a relatively new player to San Francisco politicswas floated by a $60,000 contribution from the San Francisco Police Officers Association — who have loathed Mar ever since the supervisor sponsored nonbinding legislation regarding the “San Francisco 8,” radicals associated with the 1971 murder of San Francisco police Sgt. John Young — and $20,000 from tech magnate Ron Conway. Soft money for Mar comes from unions. The California Nurses Association has spent $42,802 on the supervisor, and a committee controlled by the San Francisco Labor Council spent another $98,000. It’s possible that soft-money spending could break $1 million once the final results are tallied: Lee’s soft-money support spent $40,000 a day since Oct. 30, except for Nov. 1, when $70,000 was spent.